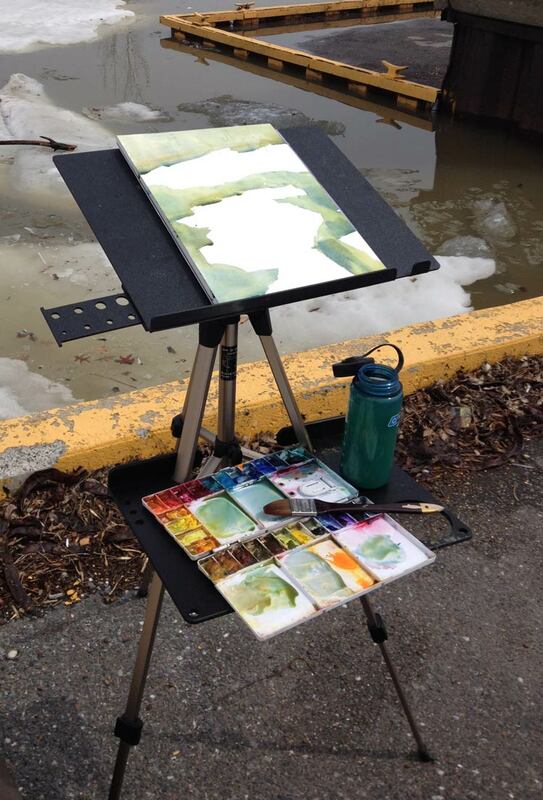 With the warm weather today, I thought it might be a good time to try out my new plein air easel (shown below). I went down to the lake hoping to see the ice starting to crack, but with the sudden heat it was almost all gone! 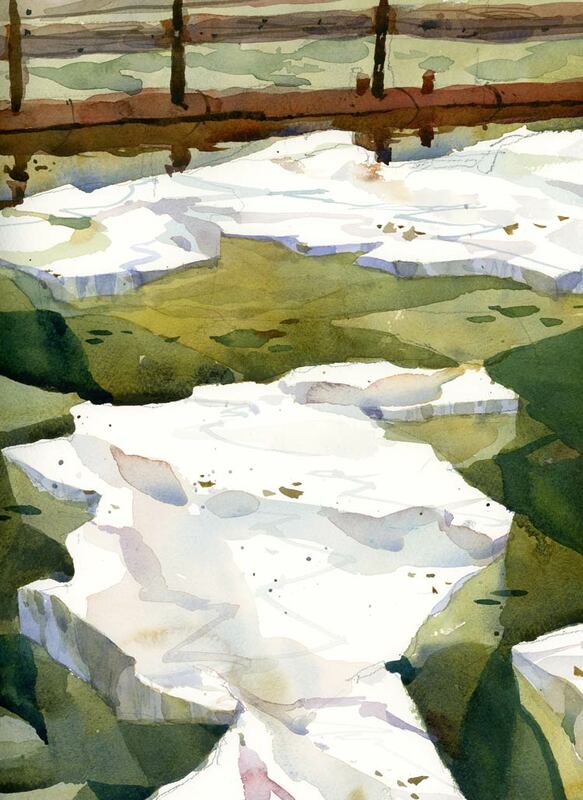 I found a bit of it trapped in between the docks at the yacht club but even in the short time that I was painting the mini-icebergs were starting to sink. The easel is one I’ve been coveting for a long time. It’s the Eric Michaels Plein Air Pro, purchased in advance of my workshops out west. It’s light, fits into a carry on/backpack and takes about 8 seconds to set up. Great watercolor. I love the colors. What a nice set up. I am going to have to take a look at that easel. I am happy for you to see the last of the ice. Lovely sketch of it and wonderful easel! I will have to look into that sometime. It beats working on your lap that’s for sure! I’m happy for me too Linda! Glad to see the end of it but there is snow in the forecast for tomorrow. Crazy up and down weather we are having. You should also check out the easel. It’s so light and fast to set up. How do you like your new travel easel? I have been thinking about buying one for a long time but am still waffling as to whether I need it. I love this one Charlie. It’s really light and so fast to set up! It was a warm day yesterday but tonight it’s snowing again! You’re so fortunate to have a comfort zone to escape when the weather is unfriendly with your ability to paint lovely scenes. Wow, and it helped you paint another masterpiece! It’s a great easel Miz Dee. And it was so nice to be painting outside! I really must toughen up and do some more painting outside seeing you’re painting ice! The painting is delicious – and thanks for showing the clever easel. I have a metal music stand at home which could probably work similarly – will try it out. That music stand would probably be great. And it wasn’t that tough to paint this one outside. It was a really warm day. Hi Shari I’m sure your idea of really warm is different to mine! I remember coming out of the depths of winter in the UK and thinking how fabulous 5C was! Not sure I could handle that just at the moment but we are heading toward the cold again here. 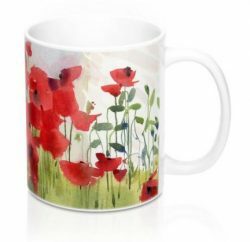 At first glance I saw a beautiful abstract watercolor. It has a cubist look about it. At second glance, I saw a really powerful example of how to identify shapes in subject matter and bring them to reality on paper. Now,as I continue to study the painting I see a very nice work of art, a painting that reveals many underlying truths. Thank you for the lesson. Thank you George, for such a beautiful description of the painting. Beautiful washes…looks so realistic and cold! The ice was cold but it was such a nice warm day! Oooh! I love this painting and the easel -))) Thanks for the info Shari. Thanks Mary! I love my new easel! Big like on this one; ice in water is supposed to always be blue and white, as people assume, except when it’s ice melting in urban harbors, then the colors are much grittier, dirtier, and uninviting, and you’ve captured the colors perfectly here.